Sprint Effort Variance represents the comparison of the effort that was planned (Estimated Hours) amongst the actual efforts (Spent Hours) with in a sprint. X Axis - shows last 15 sprints. 1. If the Spent Hours is less than the Estimated Hours, then Effort Variance will be positive. (in Hours) within a sprint. 5. 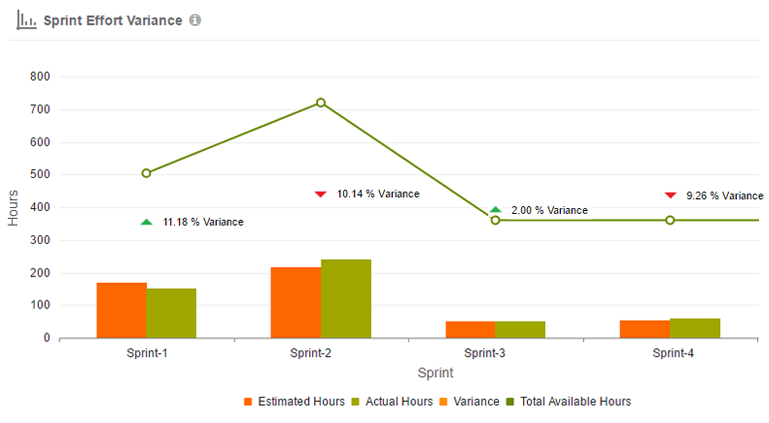 Orange Bar – Total Hours of work estimated by the Team members (in Hours) with in a sprint. 6. Green Bar – Total Hours of time spent by a Team members (in Hours) with in a sprint. 7. Green Trend line – It will show total available hours of all the sprints within a sprint. 8. Variance is based on total hours that are spent more/ less in comparison of your estimated hours. (Sprint Effort Variance = Estimation Hours – Spent Hours).